Fairtrade Fortnight 2006 saw the Oxford Fairtrade Coalition co-ordinating events right across the City and Universities – taking the Fairtrade Message into new spaces and with more interactive events and activities. Publicity for the Fortnight was included in a special pull-out section of the Oxford Mail and this flyer was widely circulated. A special 20th anniversary Mass to celebrate the link between the cities of Oxford and Leon Nicaragua. Passionate words, lively tunes and complex rhythms reflect the richness of the Nicaraguan folk tradition. Conducted by Gill Petrokofsky. Including an exhibition of Fairly Traded goods from Nicaragua in the Aula. Join Oxford Leon Link for aperitivo and Fairtrade wine. The Oxford Latin American Society (OULAS) presents a selection of contemporary poetry and novels written by women from across the region. Free Fairtrade coffee will complement this very special and informal evening. A talk exploring principals of fairness and justice within the Coffee Trade – focussing on the Fairtrade system and Starbucks’ Café Practices’ programme. Find out how far these initiatives have the potential to empower small producers, women and workers and to advancpe broader objectives of rural development and poverty reduction. Music from three fantastic acoustic bands. Fairtrade punch and organic Ales on sale. Free Fairtrade samples. Tickets £2 in advance from Nicolas Edwards, Oriel College or on the door. We’ve yet to Make Poverty History – so where next? Explore the diversity of coffee through a range of exciting tastings. Learn how the Fairtrade coffee you can ask for at Starbucks support family economies in Ethiopia. 10-1pm, Cornmarket, outside Fair Trade @ St Michaels. Come and hear a producer of Fairtrade products talk about the real difference that Fairtrade makes to communities across the world. 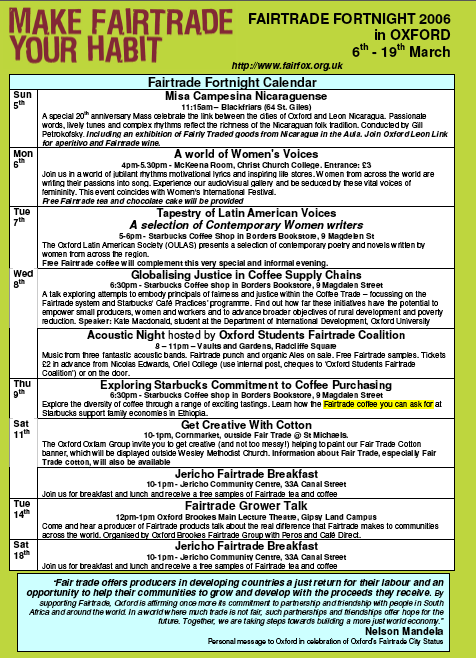 Organised by Oxford Brookes Fairtrade Group with Peros and Café Direct.